CityTurf is the first synthetic turf contractor group fully dedicated to the commercial landscaping market. This dedication shows up in our work and how we work. Our professionalism and experience is what separates us from residential turf builders. After a decade of cross over experience in everything synthetic turf, from sportsfields to landscaping, we realized the marketplace needed a full scope commercial synthetic turf contractor group. From coast to coast we can provide the service you need and deserve. Our Craftsman strive to make life easy for everyone along the way. Time is BIG money when it comes to commercial landscaping. How much does it cost to be late or to have amenities be down for your clients? On time is our number one goal, especially new developments where the landscaping is the last one in and the project has been years in the making. The CityTurf group is not a franchisee, it is a manufacturers contractor group. All our Project managers handle sales to installation. Meaning less overhead and very responsive to each clients specific needs. We understand that emotions run high towards the end on multi-million dollar projects and our team is trained to be very respectful of the process. Our commitment to our client is too always stay focused on the immediate task as well as a long-term partnership. Our people are personally vested in the profit and process. Nothing dials a team in better than being incentivized to deliver quality and ongoing successful projects. One project at a time has to start by design of the project team. Your project manager will be involved every step of the way and is a defacto construction manager. Don’t be surprised when you see all our team get their hands dirty! 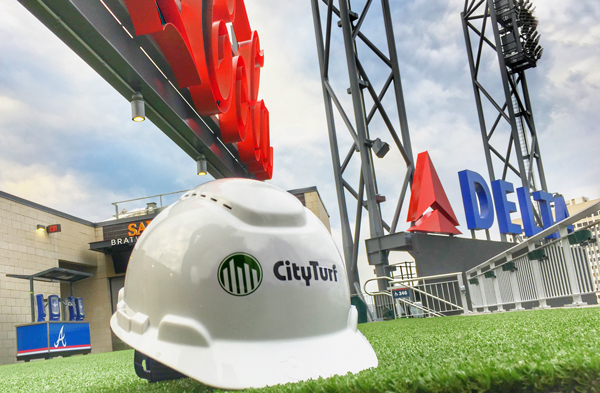 Did you know that CityTurf is powered by the Turf United family of turf builders? We discovered the match made in turf heaven. Commercial applications and Sports Fields have more in common than commercial and residential installations. That is why we created CityTurf, to use our turf teams year around.